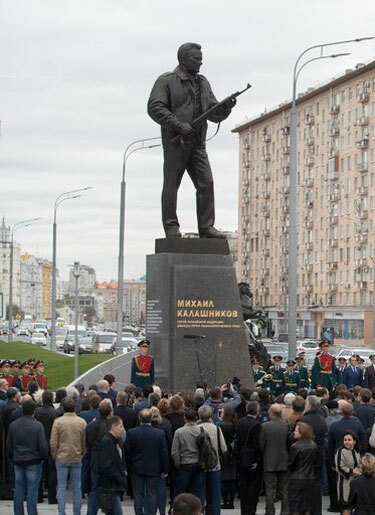 A towering monument to Lt. Gen. Mikhail T. Kalashnikov, designer of the AK-47, the Soviet rifle that has become the world’s most widespread assault weapon, was unveiled on Tuesday in the middle of one of central Moscow’s busiest thoroughfares. The bronze statue depicts General Kalashnikov, who died in 2013 at age 94, looking into the distance and cradling one of his automatics in his arms “like a violin,” according to Russian state television. The statue is about 16 feet tall, and on a pedestal about 13 feet tall. Mikhail Kalashnikov’s memorial did apparently have a glitch, however. Workers have removed part of a new monument to Mikhail Kalashnikov, the inventor of the Soviet Union’s AK-47 assault rifle, after eagle-eyed Russians noticed that it mistakenly depicted a German second world war weapon. The monument to the creator of one of Russia’s best known export brands was unveiled in central Moscow three days ago to much fanfare. But embarrassed sculptor Salavat Shcherbakov had to admit that among them was the Sturmgewehr 44 (StG 44) assault rifle used by Nazi troops. The US Government ought to put up a slightly larger statue of John Moses Browning. 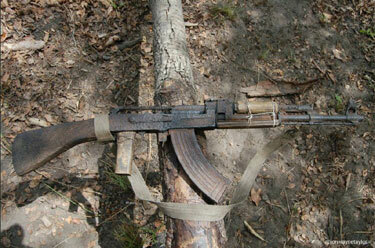 I don’t know much about these things, but I’m told this Kalashnikov is a Type 56. 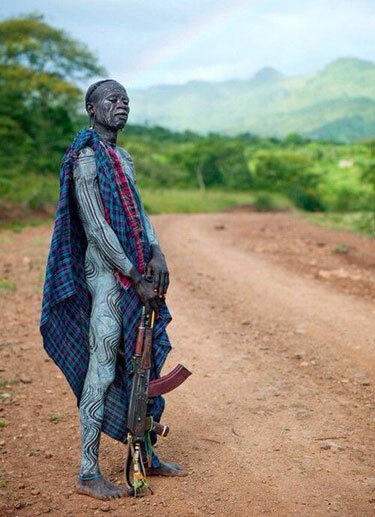 The CEO of Underground Tactical reportedly took it away from a poacher somewhere unspecified in Africa. And, even in this condition, it still shoots! Jon Wayne Taylor on Instagram was the original source. 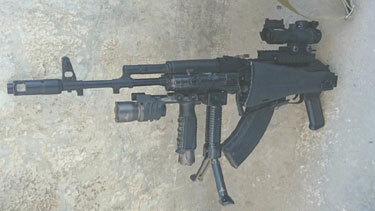 This number sports no fewer than four lights, three optics, and four vertical front grips! 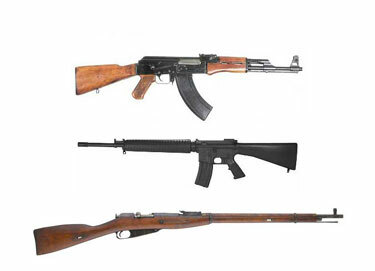 Gun collectors these days moan and groan all the time about Bubba-style American customizations of pre-WWII military longarms. Oh, those replaced stocks, the receivers drilled for scope mounts, the final horror of white plastic spacers on the pistol grip cap and buttplate! 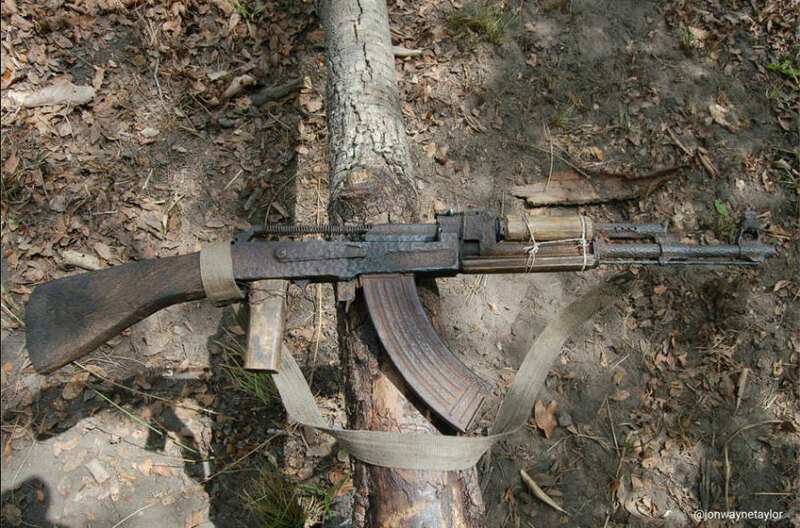 Forgotten Weapons today did a very amusing post discussing what Ahab the Arab can do in the way of customizing his trusty AK-47. And liberals want to ban these things! 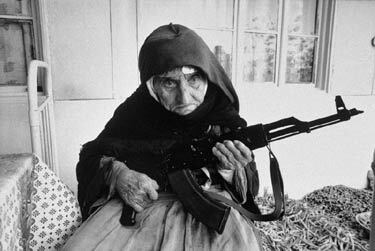 Reputedly: “106-year-old Armenian woman sitting in front of her home guarding it with an AK-47 in the village of Degh, near the border of Azerbaijan.” But the photo is several years old, is all over the web, and appears on a number of Russian-language motivation posters. I was not able to find a reliable source or attribution. Popular Mechanics talks to C.J. 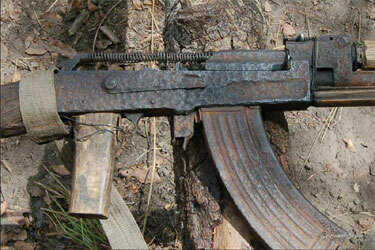 Chivers, author of , who shares some interesting insights on the infamous AK-47 assault rifle. 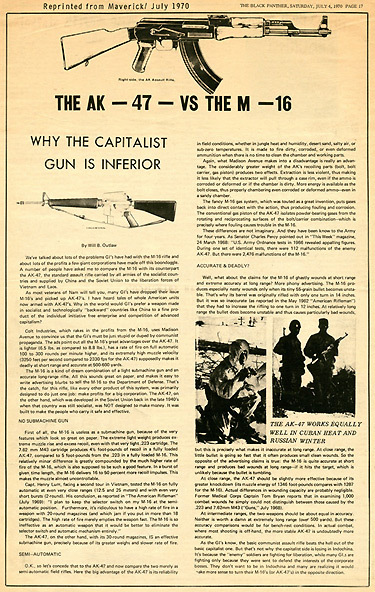 It was not really the sole invention of peasant genius Mikhail Kalashnikov, and the Communist world’s ability to distribute examples by the millions was not so much the result of the weapon’s simplicity and cheapness of manufacture as a serendipitous (from their point of view) result of command economies. 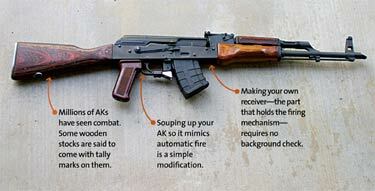 For the Soviet Union, the AK-47 is arguably the most apt physical symbol of the Soviet period and what it left behind. It was the Kremlin’s most successful product, even the nation’s flagship brand, and it came into existence through distinct Soviet behaviors and traits. 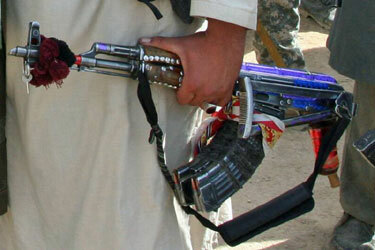 But it was a breakout weapon, and its fuller meaning and deeper legacy lie in its effects on security and war. It leveled the battlefield in many ways and changed the way wars are fought, prompting a host of reactions and shifts in fighting styles and risks. Its effects will be with us for many more decades, probably for the rest of this century, at least. This is perhaps its real legacy—as the fighting tool like no other, which we will confront, and often suffer from, for the rest of our lives. The correct translation of sturmgewehr, the felicitous term coined by Adolph Hitler himself, is really “assault weapon.” It is a “storm rifle” in the sense of a rifle desiged for storming enemy positions, not a weapon as formidable as bad weather. Hitler’s coinage was a typically exaggeratedly romantic misnomer. The Sturmgewehr 42 was designed to be a compromise mixed-use weapon combining the some of the long range accuracy of the infantry rifle along with the firepower of the submachinegun. In WWII, the German Army found the role of infantry had changed. Instead of dominating the battlefield and exchanging fire with other masses of infantry, infantry principally spent its time accompanying and protecting tanks from being disabled or eliminated by other infantry. Most exchanges of fire were at close range where high rates of fire would be desirable, but simply taking away all the Mausers and giving every infantryman a Maschinenpistole-40 “Schmeisser” firing 9mm Parabellum cartridges did not seem a completely satisfactory idea either. 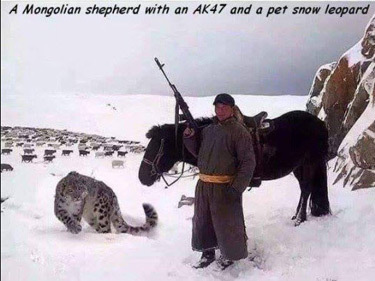 the Archives of Never Yet Melted in the 'AK-47' Category.